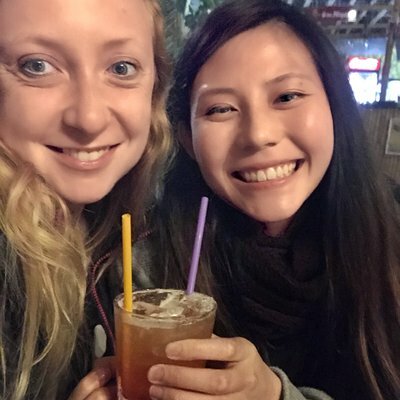 As I sat at the dinner table, surrounded by friends eating Thanksgiving dinner, I realised I was terrified of my upcoming trip. It was the first time in my life I’d ever traveled solo, let alone somewhere as far away as Nepal. Up until that point, Nepal was just somewhere I was going to at some point in the future. It was just an idea. But now the day had arrived it was real and I was anxious. What would that part of the world be like? Would I feel welcome and at home? Would I make friends? I had 17 hours worth of air travel to worry about the answers to those questions. During my flight from Kathmandu to Pokhara, as the Annapurna mountain range came into view, the anxiety eased. It was breathtaking. 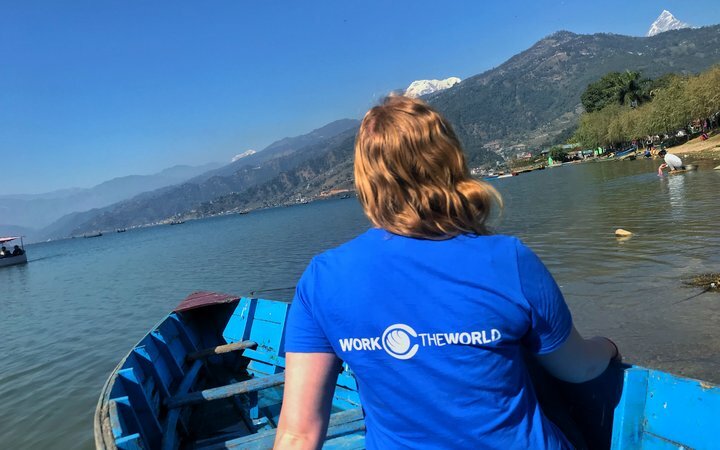 My plane landed in Pokhara itself, and I was immediately put at ease—the flight had landed early, and the Nepalese people at the airport got a hold of the Work the World team to let them know. The next few hours of my trip was a reflection of what the rest of my experience in Nepal would be like. A member of the Work the World team came to collect me and took me back to the house. She showed me around, made sure I was comfortable and gave me plenty of time to shower and gather my thoughts as I settled in. It was around 7pm that night that when I heard voices. 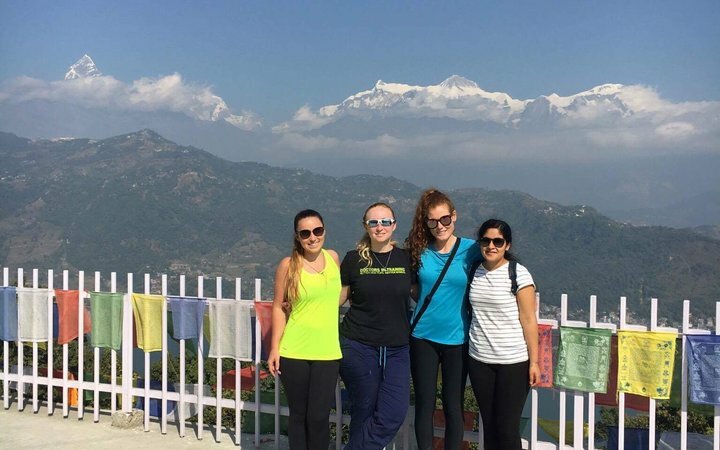 The other students, who were already living in the house, had returned from a weekend of adventure out in Nepal. I have to admit that I was a tad worried that as they all knew each other I’d be left out. But as soon as the girls staying in my room walked in, I knew everything was going to be okay. They were so welcoming, and as fortune had it they were also solo travelers. And so that became the theme of our room—three girls who took the plunge to travel by themselves to an unfamiliar country! We went out for dinner that night, and everyone was excited to show me the ropes. The food was incredible. 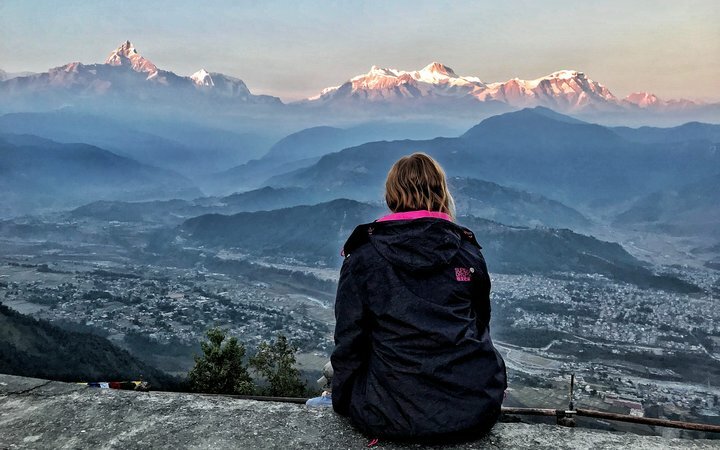 It wasn’t until the next morning that I experienced Pokhara’s overwhelming beauty. 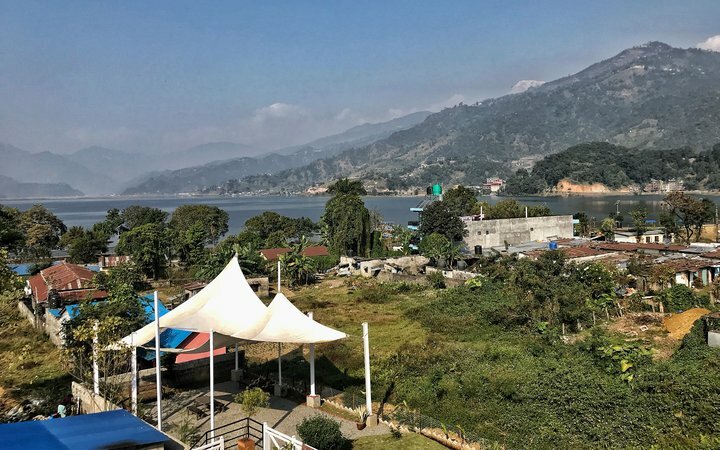 As we went to breakfast the next day at Lakeside—Pokhara’s ‘downtown’ area—I couldn’t help but stare in awe at the mountains in the background of Phewa Lake. It was like something out of a fairytale. More students came the following day, and our two groups quickly came together as family. 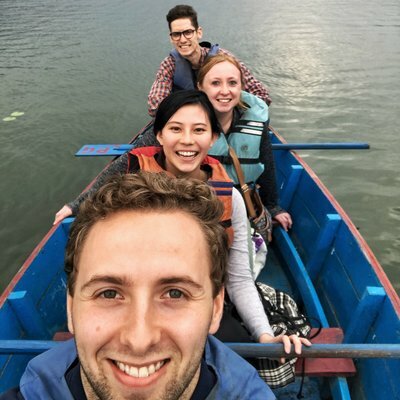 With the group who had already been living in Pokhara, I learned how to navigate my new home through their experience. With the new group, I shared in the excitement of learning about a new country. It was a perfect experience. The Work the World team taught us all about the city—how to navigate to our placements, how to catch buses, how the local currency worked, and how to find all the best places to eat. Within a couple of days I felt like I could go anywhere. I was totally confident walking from my placement hospital to Lakeside and back home to Damside all on my own. 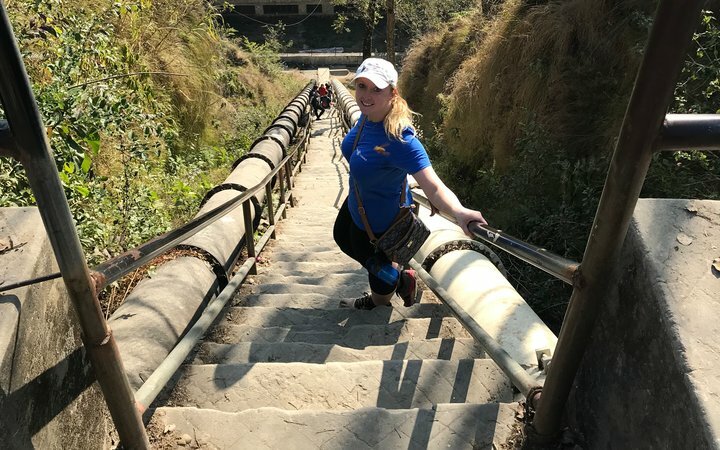 I felt more comfortable walking around Pokhara than I did walking around my own home city of Chicago! When placement started, there was a steep learning curve. 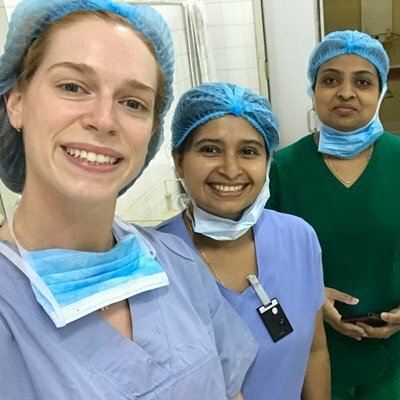 The hospitals were very different from home, and it was essential to keep an open mind as I couldn’t learn new things with an exclusively ‘Western’ perspective. My time in the hospital was one that totally changed how I viewed patients once I returned to the States. 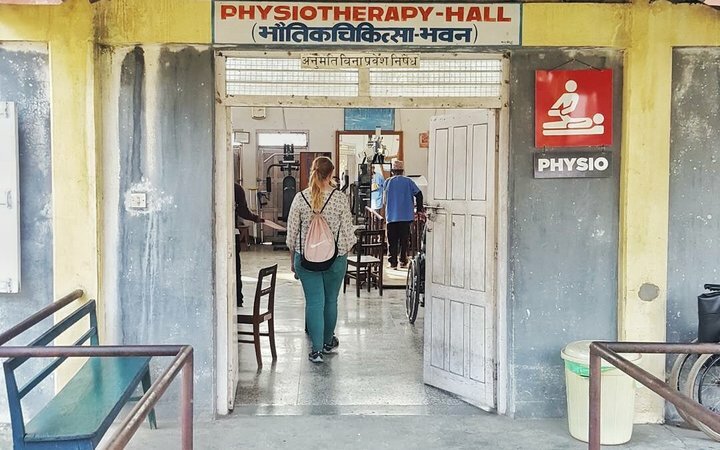 Healthcare was a privilege in Pokhara rather than a right. It wasn’t uncommon to see patients turned away due to their inability to pay. If they couldn’t afford treatment, they wouldn’t receive it regardless of the consequences. Originally, I thought this was harsh, but I learned that over there it’s a way of life. Local doctors told me, however, that families typically found a way to raise the money. 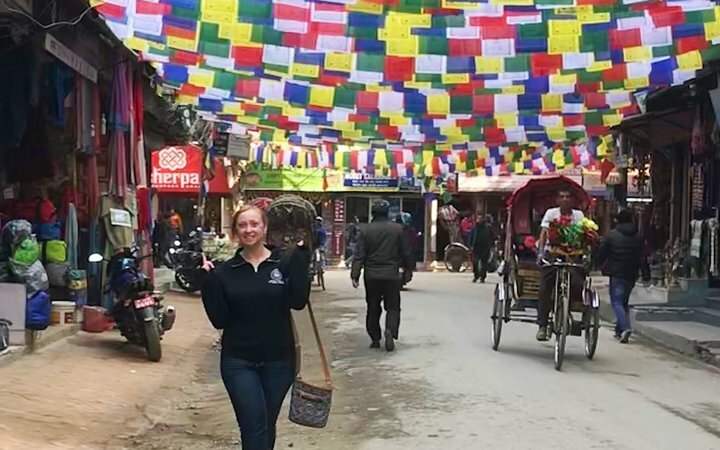 Seeing how much family was valued in Nepal was heartwarming—it was the cornerstone of their culture. I spent a lot of time in the ICU. I saw things that I’d only previously seen in textbooks — TB, meningitis, and altitude sickness to name a few. I told them that of course we did. Our countries weren’t so far apart after all. I saw true human spirit when I was in the ICU. Patients—no matter what was happening—always smiled, brought their hands together, bowed and said Namaste. It was beautiful. Spending time with local medical staff and students was a great, welcoming experience. They taught me about Nepal but also asked me questions about home. It was a two-way street. Many of them hoped to come to the States someday, so wanted to know everything about my home. They often spoke to me in English but also taught me some Nepali. On that point, most people I met in Pokhara spoke English. 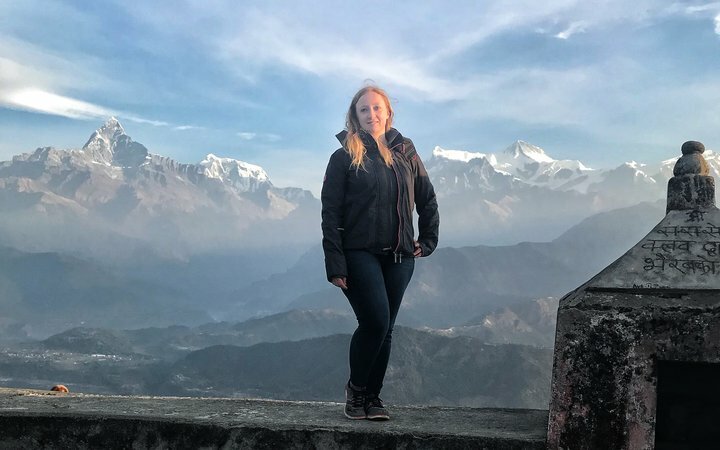 My patients were less proficient with English, but I was prepared to speak with them in Nepali thanks to the Work the World language coach in the house. I could ask basic questions, and the rest of the information I needed I read from the English patient notes. Beyond my own placement, I learned a huge amount about healthcare from my housemates. I lived with physical therapists, nurses, and dentists. We shared stories and swapped practise tips all the time. One day, a group of us ventured out to a hospital funded by an NGO that helped patients with Leprosy. This hospital had patient housing and medical staff dedicated to teaching leprosy patients how best to care for themselves. Staff also offered treatments to patients at no cost. We toured the grounds, and met and spoke with patients who were suffering from the disease at various stages of development. 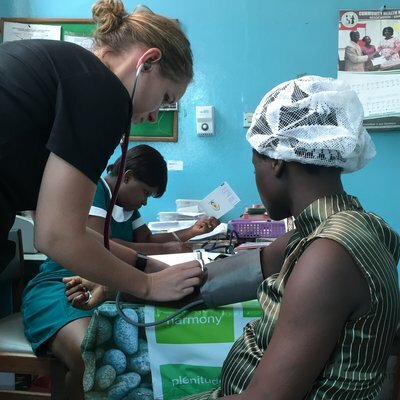 It was an impactful experience as it’s not a common disease in the States. I can still see the faces of each of the men we met and how happy they were to see us. Of course, my trip wasn’t all about healthcare. I had plenty other life-altering experiences. I met people from every corner of the world. Australia, South Africa, Qatar, and even other Americans. 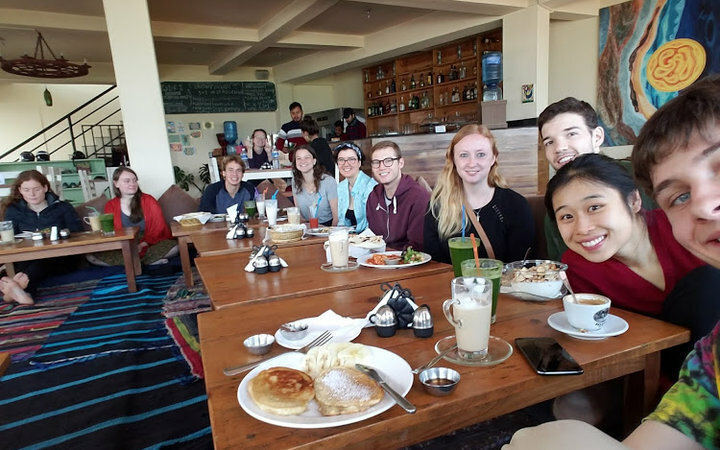 Together, we explored Lakeside’s food scene, finding what must be the best crepe place in the world. We drank the most potent, but delicious, mint lemonade, sampled various momos (dumplings), ate dal-bhat with our hands, sampled Israeli salads and breakfasts, consumed more egg-filled avocados than is probably healthy, and went drinking together under the night sky. We spent time watching movies at Movie Garden—a local outdoor movie theater. 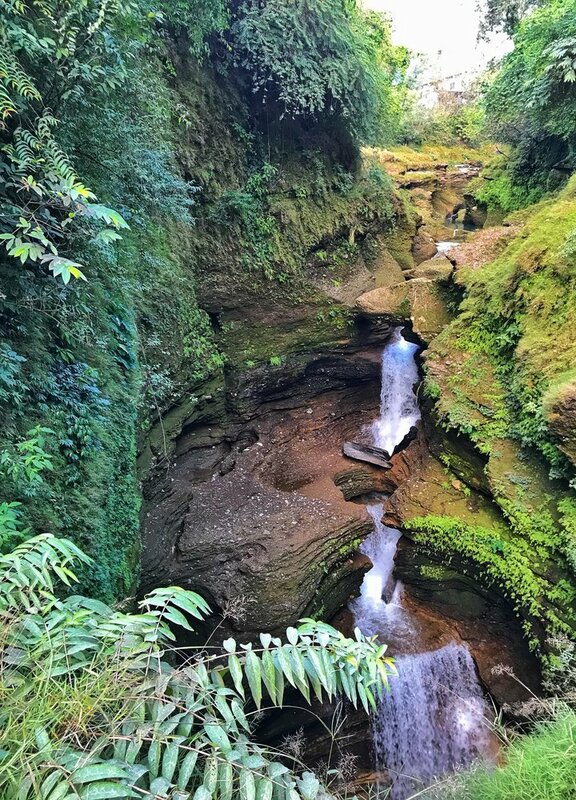 Hiked to places like the bat cave, Davis Falls, and the Peace Pagoda, all offering their own unique insights into this hidden part of the world. The weekends were reserved for our big adventures. We reserved the first weekend for paragliding. 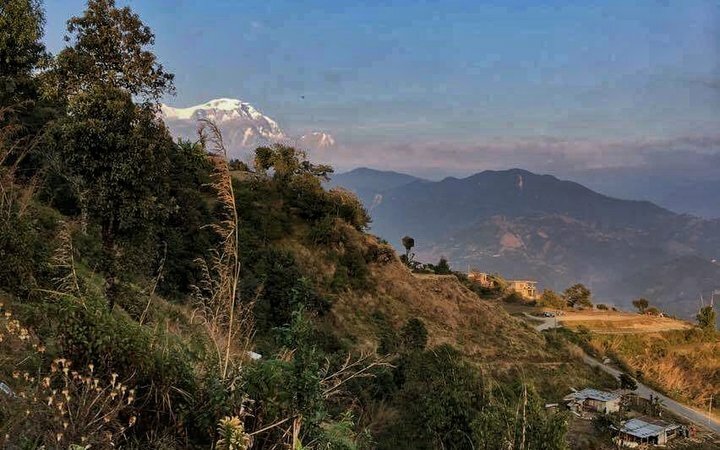 A group of us set out on Saturday afternoon to begin our hike up to Sarangkot—a local mountain village 5000 ft above sea level. The local people told us it would only take about an hour and a half to reach it, but it took us closer to three. The heat of the day paired with the change in altitude (and oxygen) meant that we took breaks every half hour. Obviously we weren’t as well adapted as the local population. 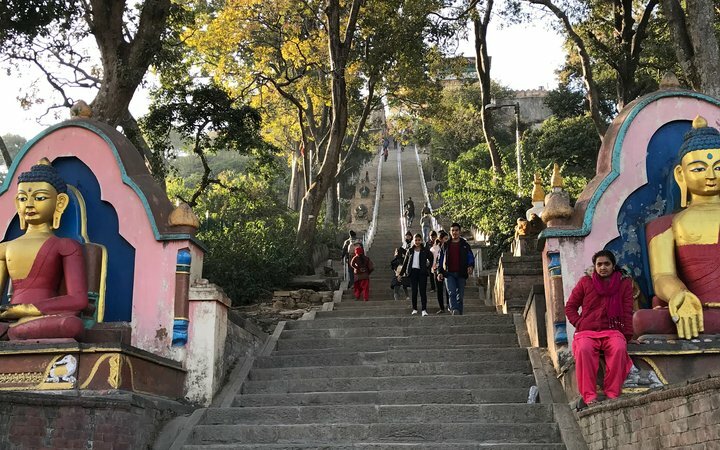 It also turned out that Nepali people love stairs. My thigh muscles learned just how hard 50 flights of stairs could be. 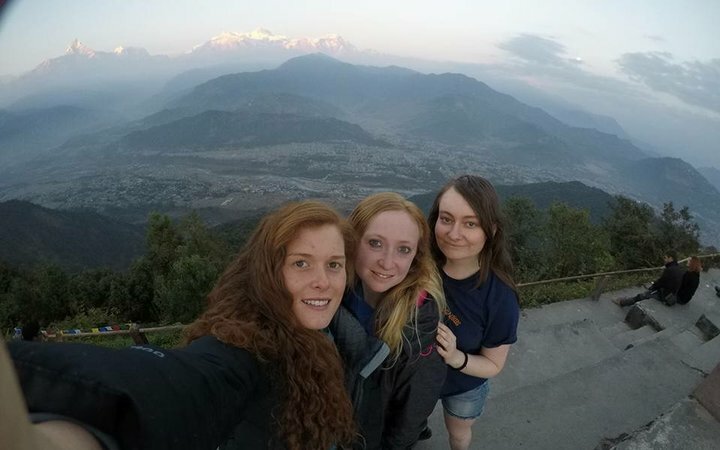 But we reached the top just in time to watch the sun set over the Annapurna Mountains, and it didn’t disappoint. The sun painted colors across the sky, and the mountains stood sharp against them. That night we stayed at a hotel at the top of the mountain. We played cards and ate plenty of food before retreating to our rooms. When it reached midnight, the girls in my room and I looked out our window. Fishtail (one of the Annapurna peaks) stood out, strikingly, against the dark of the night. In the morning we watched the sun make its journey back from behind the mountains. Then, the true adventure, tandem paragliding, began. 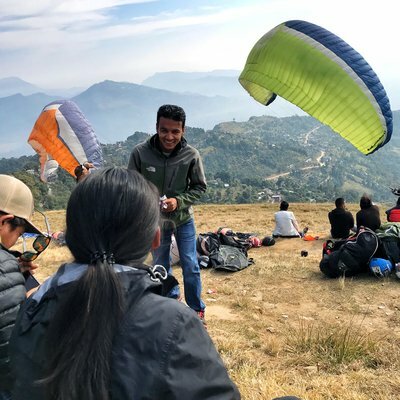 I flew through the skies in front of one of the best backdrops in the world—snow-capped mountains surrounding me and the magnificent Lake Phewa beneath. 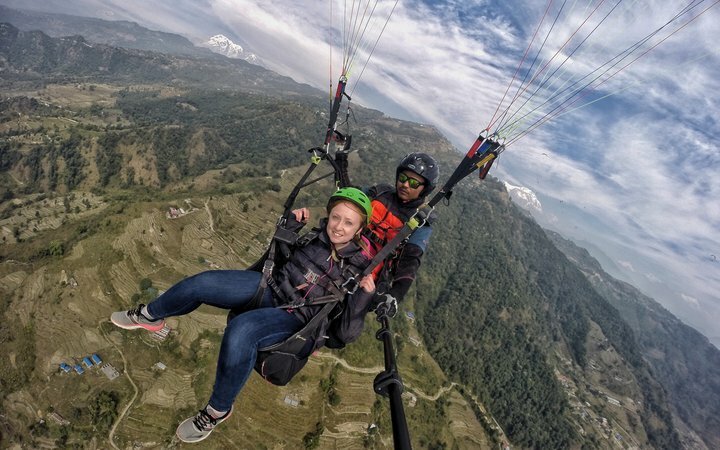 I said yes to “tricks” when they were offered, which prompted my (more experienced) tandem paraglider to start doing flips and spirals towards the lake below. It was thrilling. Easily in the top 5 experiences of my life. 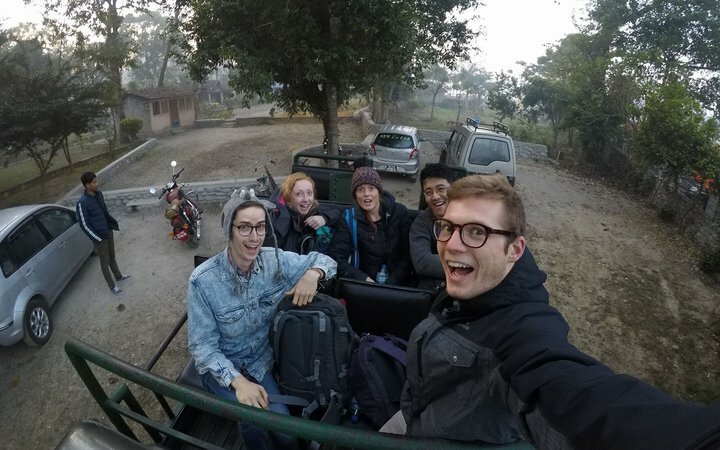 On another weekend we traveled together to Chitwan National Park. We took a local bus down to the park, which was an experience of its own. It was a precarious six-hour ride along a narrow road that, on one side, had a cliff edge that plunged hundreds of metres down. I’m happy to say we survived, with lots of locals laughing at us as we screamed at the back of the bus. They mustn’t have realised that watching local people pray and perform the cross of benediction during a bus ride was worrying. 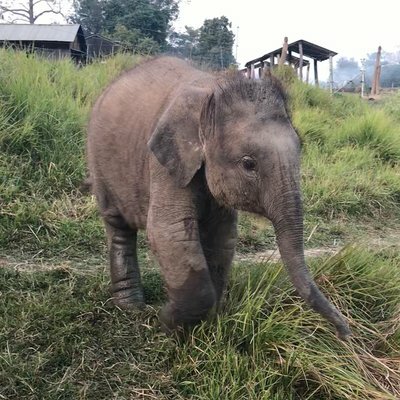 When we arrived at Chitwan National Park we went on safari. 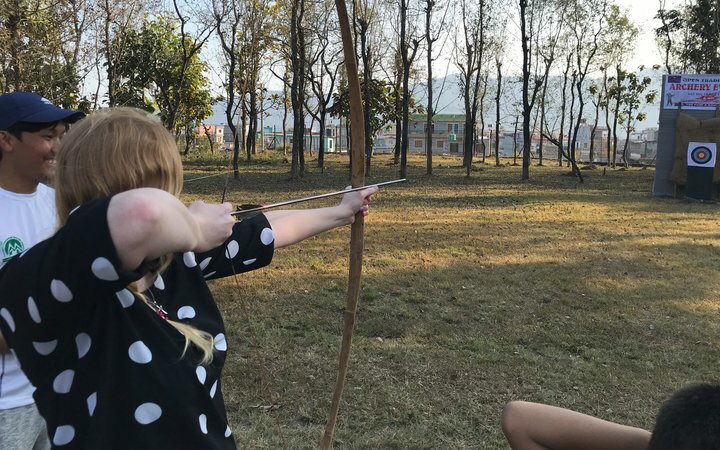 While we were there, we rode a canoe in crocodile-infested waters, and bathed an elephant, which was in actuality a very seriously one-sided water fight. 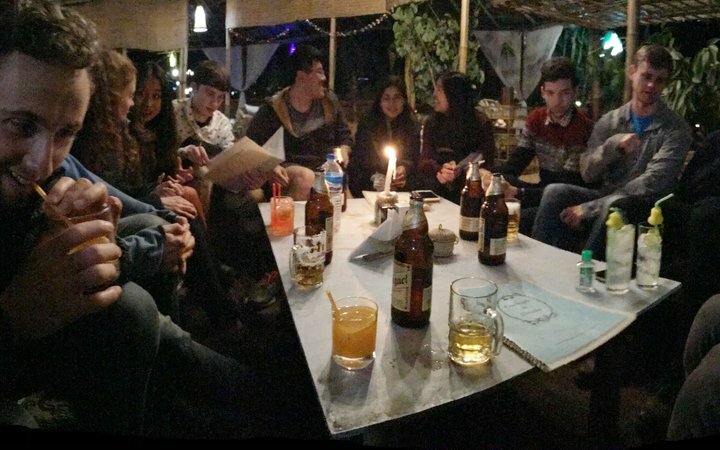 We spent an evening in Kathmandu the night before some of us were due to fly home. 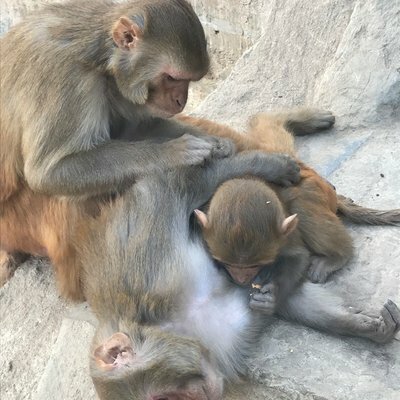 We explored Monkey Temple and Thamel. The city was vastly different from Pokhara. 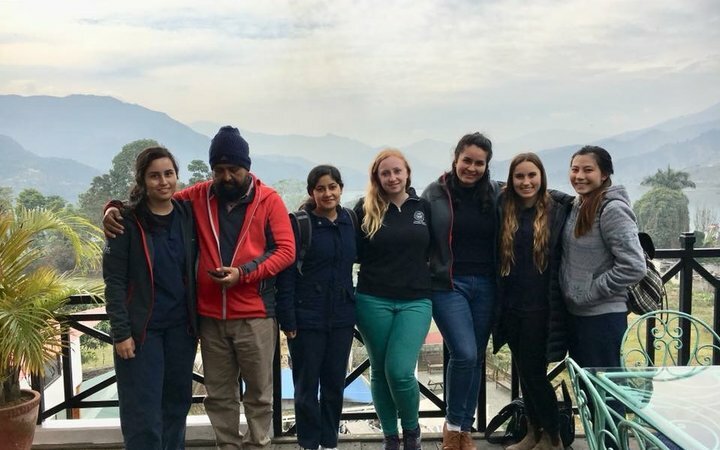 A great benefit of having two Work the World houses in the same country is that we did get to spend time with the students from the Kathmandu house as they came out to visit Pokhara and vice versa. 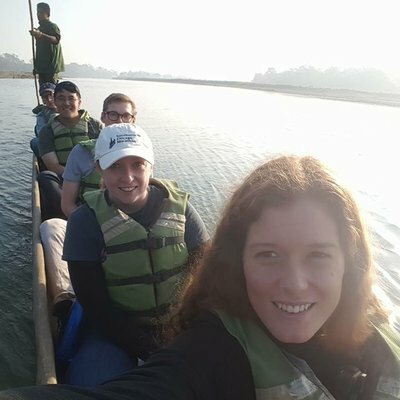 I’ve been back home in the States for seven months now, and there isn’t a day that goes by I don’t think about going back to Nepal. 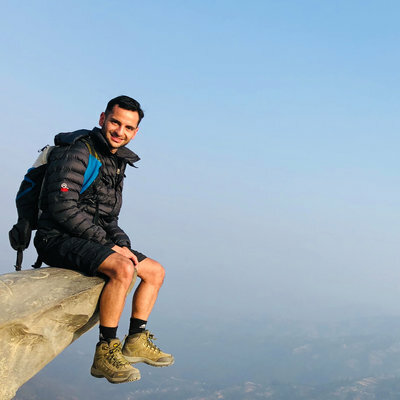 I think about my adventures, the familial bonds I created with strangers from different parts of the world, and the culture of the Nepali people. I still talk over Facebook with some of the people I met there, and we plan to meet again. I’ll always feel part Nepali and Nepal will always feel like a second home. All it took was a month-long placement with Work the World to feel that. If you’re reading this, go to Pokhara. And don’t be afraid of going by yourself—there’s no experience like it.